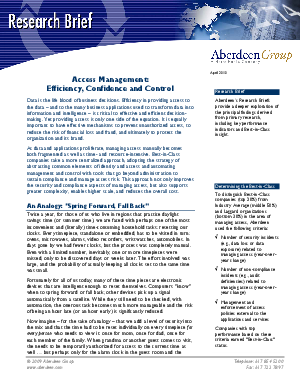 Read this Aberdeen Group research report, “Access Management: Efficiency, Confidence and Control” and learn how top performers protect access to information assets at lower cost while staying on top of compliance. See clearly. Think clearly. Act clearly. Gain real-time visibility of information – to help ensure a compliant business, better manage resources, and reduce the expense of meeting governance requirements.